That One Song: Piranha Rama “Oh No” | Music | Style Weekly - Richmond, VA local news, arts, and events. Piranha Rama is, from bottom left, Kenneka Cook, Ryan Jones, Chrissie Lozano, John Sizemore and Tim Falen. Piranha Rama is a musical amalgamation of spaghetti Westerns, lucid psychedelic rock and '60s action-adventure romps. The group operates on the same killer wavelength that drew it together and that shows on its self-titled debut full-length. At a musical crossroads, the founding members of Piranha Rama were all adjusting to either being bandless or searching for the next thing. Drummer Tim Falen insisted that bassist Chrissie Lozano start another band with him after the two ventured away from Lady God. 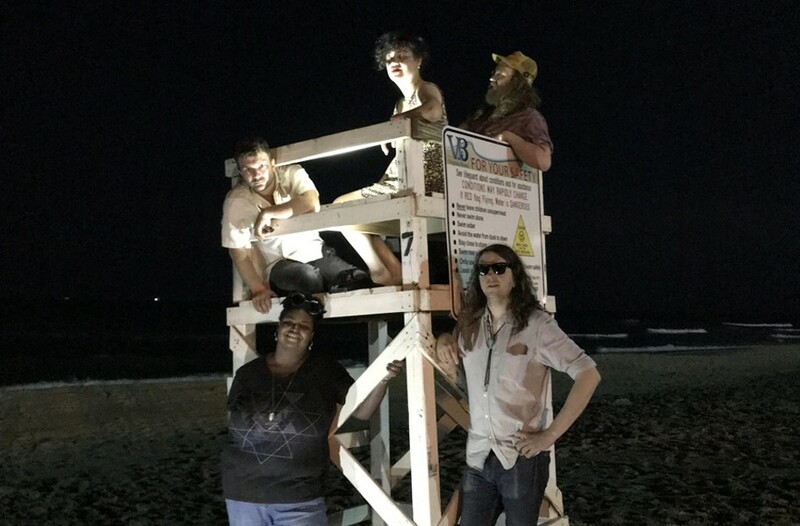 Guitarist John Sizemore and keyboardist Ryan Jones had been in musical limbo since the temporary breaks of their respective projects, the Milkstains and Warren Hixson. A genuine affection for each other's musical styles brought them into this fold. "There's a lot of secretly shy people working together and throwing it all out there," Lozano says. "I want to keep doing that. It's like a party." In a little more than a year, the band has left a strong impression with dynamic live performances showcasing an ever-expanding repertoire featuring horns, guests and added harmonies referred to as "the panorama" as well as a relentless ambition for never shying away from any musical idea. Style had a chance to chat with Lozano and Sizemore about their new track "Oh No" and how that reflects the band's chameleon habits. Style: Tell us about "Oh No." Lozano: "Oh No" is probably the most involved song on the album. While several of the tunes bring in members from the panorama, as well as friends and family outside the band, this one truly is what I call spaghetti — just little tastes of this and that weaving around; musical wine glasses, guirro, tons of vocals and just a lot of moving parts complementing, not competing. That's the goal in my mind anyway. Style: How did the band form and where did the name originate from? Sizemore: I had several instrumental songs recorded but I didn't feel like my voice was supposed to sing them. I wanted to collaborate outside the usual group of musicians that I play with. Then one night at Bamboo, I was talking to Chrissie and mentioned what I was working on. She was itching to try something new. I had seen many shows Chrissie played and always truly admired her voice and bass playing. I emailed her the songs that night and pretty soon after she sent songs she was working on. Tim and Ryan joined shortly after that. It became a band of musicians I had always dreamed of playing with. Lozano: We toyed with the usual amount of name ideas, inspired by the usual stuff — aversions to three-pronged forks, cosmic skepticism, etc. The vibe I think we all agreed on was kind of "to hell with it, we'll try anything." And so the frenzy sort of determined the name choice. Ryan told everyone that Piranha Rama was our name before everyone agreed. Style: The band has continued to expand in Piranha Rama's short lifespan. What inspired that growth and what kind of effect has it had on the dynamics? Lozano: We always wanted to have a rotating crew of guest backing vocalists. We'd done a few shows initially with Kenneka Cook. And then horns seemed like a cool surprise for everyone. We asked our friends Bob Miller, Gordon Jones and Reggie Pace if they knew any horn players that wouldn't mind working on the fly. Their collective response was that they were all interested themselves. After a show together, the one-time offer became an open invitation for whenever they are available to be a part of the panorama. The energy and spirit that the panorama generates is something special. If feels like endless possibilities and I want to pass that around to other people. Style: What is the main take away you want listeners to get from the debut? Lozano: Well, I don't know if it's all that remarkable to have a band say, "We're just all sort of out there in the same way, man," as much as that is definitely a thing. I think most of us are "yes" people that have been in a lot of "no" situations, creatively and otherwise. And now it's just like "crank the faucet, weirdo, I'm not telling you to stop." Piranha Rama celebrates the release of its self-titled debut on Friday, July 20, at Strange Matter with Minor Poet and Big No. 10 p.m. Tickets cost $10.